A Panhard rod is a suspension link that both locates the lateral position of the rear axle housing and controls side-to-side movement. Factory S197 Mustang Panhard rods are made from weak U-shaped stamped steel with soft rubber bushings that allow excessive deflection under load. BMR Suspension’s PHR013 Panhard rod is made 1.25-inch, 0.120-inch wall DOM tubing with TIG-welded chrome-moly tube adapters. The PHR013 features BMR’s CNC-machined center adjuster, which is made from 4130 chrome-moly with rolled threads. One end of the rod features a zinc-plated two-piece, X-series, heat-treated, chrome-moly, self-lubricating, Teflon-lined rod end. It also features 304 stainless steel, custom designed rod end spacers. The other uses a greasable, 95-durometer bushing, which adds a solid, more responsive feel over the stock rubber bushings. BMR’s bushings are internally fluted, which allows grease to evenly coat the inner sleeve, keeping grease in the bushing under high compression loads. These flutes also direct grease to the outer edge of the bushing, keeping the thrust surface lubricated. This efficient lubrication ensures quiet, reliable operation over the life of the bushings. The bushing/rod end combination gives you a great blend of performance and comfort street and track use. BMR Suspension designed the PHR013 to work well for street performance, drag race, and road race applications. The heavy-duty construction eliminated the deflection seen in stamped-steel Panhard rods. Other Panhard rods on the market include rubber bushings that will deflect under heavy loads. The 95-durometer polyurethane bushings of the PHR013 reduce bushing deflection, giving you much-improved, repeatable handling characteristics on the street, starting line, or in aggressive corners. The rod end further reduces deflection for high horsepower and track applications. The chrome-moly center adjuster makes the PHR013 on-car adjustable, so all adjustments can be made without removing the Panhard rod. This gives you all the adjustability you need for great handling without huge increases in NVH. When performance is a must, rely on BMR Suspension! 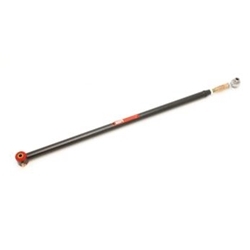 BMR Suspension’s PHR013 on-car-adjustable Panhard rod is available in black hammertone and red powdercoat for long-lasting good looks. Installation time is about 1 hour. Proudly made in the U.S.A.